Pure glycerin soap in an easy to use pump bottle. Made in England. England's finest! The name everyone knows in horse and leather care. The distinctive blue and white livery of the Hydrophane products easily identifies this product leader in the world market. 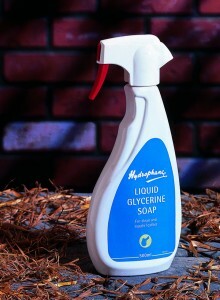 Hydrophane products have been used to care for horses and tack for generations.